Magunga is trained in law at the University of Nairobi. However, the dream is to write. He started a blog when the writing bug got him in 2012. It became popular among his peers until it gained more traction and he got nominated and won awards. To be able to tell a good story is my only vanity. So I write for a living, but most importantly I write to live. 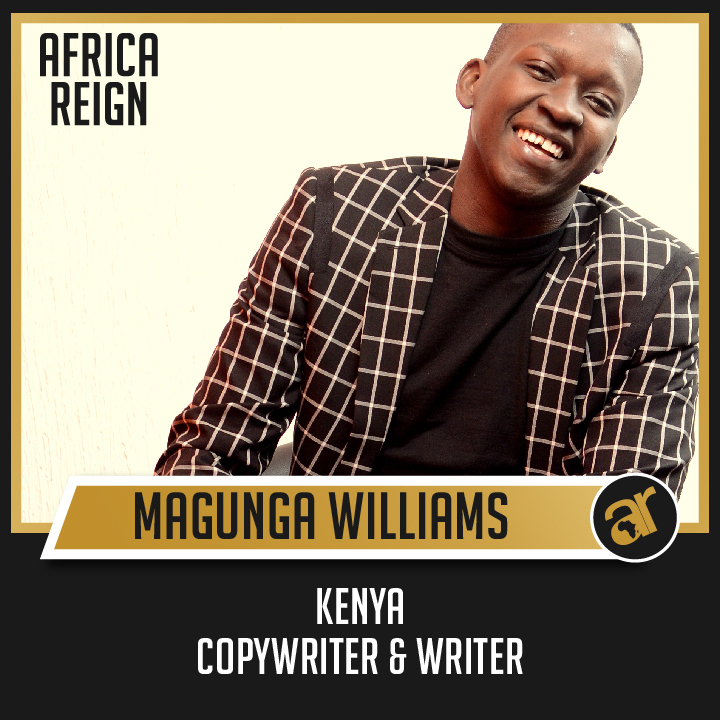 His website (www.magunga.com) is a creative writing hub. A wonderland for fascinating stories. Magunga believes that we all live and die by the stories we tell and everyone has a story. It just needs to be told.The website concentrates on fiction, creative non fiction, poetry and book reviews. I welcome people who have the talent to write but not the space or audience. I share my space with them, and I hope that this platform will someday grow to become Africa’s most read creative writing hub. It means hope. Hope in Africa. Africa as a continent has so much potential yet it remains untapped for many excuses that pose as reasons. I am hopeful that this initiative will break these barriers and unlock our potential. We can take the centre stage in our different fields. I plan to unite a continent by telling stories through my website and social media pages. Other young people in other fields should also take the lead in their own spaces. We have been ‘leaders of tomorrow’ for far too long. Tomorrow is here now. Enough? No. Not enough. There can never be enough motivation for development. We should always be motivated to do more. The moment we say “enough” is the moment we become complacent, and we cannot afford complacency. What is Literature’s role in developing a better Africa? Literature will keep telling the stories that need to be told. Literature is the point of knowledge. That means it is the source of inspiration, entertainment, opportunities and power to develop the mind. Literature has been playing this role for the longest time, especially for Africa. Sadly, many of us have not been watching or listening. Words are living things – Rix Poet.